Currently natural rubber production occurs by the rubber tree for which ~ 90% is grown in South-East Asia. Several aspects form a potential problem and threat for the natural rubber production in South-East Asia. First, due to the increased consumption in China and India, a shortage of natural rubber is foreseen. Another important threat is the South American Leaf Blight Disease which reaches Asia. Furthermore, due to climate changes a lower production will be obtained, especially in Thailand. A last very important aspect is that rain forests are stripped for rubber plantations. The roots of the Russian dandelion (Taraxacum kok-saghyz), although they have little mass, contain a high percentage of natural rubber. By crossing this dandelion with the common dandelion a genotype is identified with more root growth but with the same high percentage of natural rubber. Natural rubber from dandelion has several advantages compared to natural rubber from the rubber tree. The roots can contain 5-10% dry weight rubber. Furthermore the roots contains also the valuable component inulin (35% dry weight), which is used as dietary fiber and building block for bioplastic. A last important advantage is that dandelions are able to grow very well in a temperate climate. 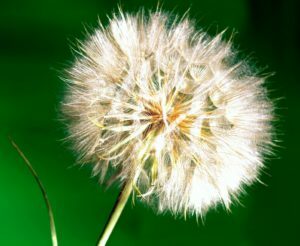 Next to these valuable points the topping of the dandelion can be used for feed and biogas. For increasing the amount of latex in the root (from 200 kg/ha to up to 700 kg/ha) accelerated breeding is used. A physical and genetic map are generated and markers are identified for rubber biosynthesis genes. With the Keypoint® Mutation Breeding technique mutants are generated and screened to reduce latex co-aggulation.